The United Nations Association was founded in 1943 and then renamed the American Association for the United Nations (AAUN) in 1945. 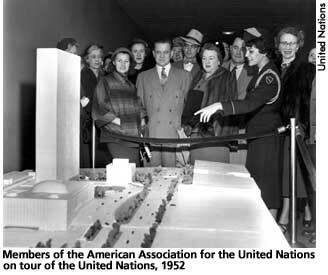 As an organization, the AAUN had two central goals: to educate the public about the United Nations system and to encourage the active participation of the United States at the United Nations. Eleanor Roosevelt was involved with the AAUN from its inception in 1943 and officially joined its Board of Directors in December 1947. While an official member of the United States delegation, ER did much to advance the work of the AAUN. She felt strongly that the UN was the single best way to avoid war in the future, but she was also keenly aware that if Americans did not understand the United Nations system they were likely to oppose it. ER's take on the situation was later proven correct when, in the early 1950s, the UN suffered a decline in support among the American public, largely because most Americans did not understand the organization's function. Consequently, ER lent her name and presence to many of the AAUN's fundraising efforts, donated a sizable amount of money to the organization from her own pocket, and spoke and sent correspondence on its behalf. One of the most valuable services she performed for the AAUN was in registering new members. As a prestigious UN delegate and former first lady, ER had the ability to draw a crowd, and she often used her popularity to encourage people to join the AAUN. In 1948, ER even took the unprecedented step of joining with the AAUN to support its platform on the Middle East even though she was a sitting member of the United States delegation. Immediately following her departure from the State Department in January 1953, ER deepened her involvement with the AAUN. As a full-time volunteer, she quickly became its single most important spokesperson in lecture tours that took her throughout the United States and around the world. In 1964, the American Association for the United Nations merged with the U.S. Committee for the United Nations to create a new organization known as the United Nations Association of the United States of America. That organization continues to exist to the present day, retaining largely the same mission that it had at its founding. "About UNA: Overview." United Nations Association of the United States. Internet on-line. Available From http://www.unausa.org/aboutus/index.asp. Beasley, Maurine H., Holly C. Shulman, and Henry R. Beasley, eds. The Eleanor Roosevelt Encyclopedia. Westport, Conn.: Greenwood Press, 2001, 7-8. Lash, Joseph. Eleanor, The Years Alone. New York: W.W. Norton & Company, 1972, 128-129, 168, 233, 236.